Can I Feed My Pet Bird "People Food"? Question: Can I Feed My Pet Bird "People Food"? Answer: The answer to this question is an enthusiastic "YES"! Not only do most birds absolutely love sharing dinner with their human flock, fresh foods offer unsurpassed variety and nutrition as compared to commercial bird diets. Unlike cats, dogs, and other pets, "human" food is actually good for pet birds, when prepared and fed correctly. In order to safely and successfully add fresh foods to your bird's diet. Fresh leafy greens, root vegetables. and organic fruit are all good examples of feeding a quality diet to your birds in order to maintain good health. however, it's important to remember a few guidelines. Raw is sometimes better than cooked. 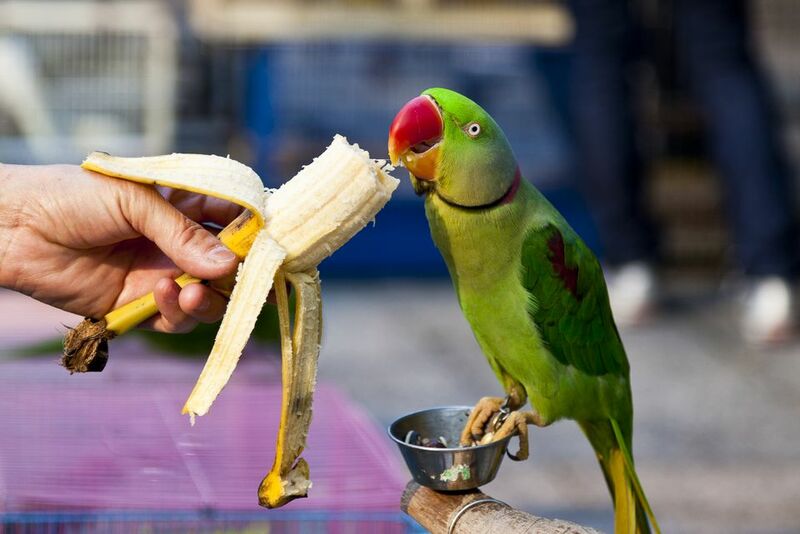 When feeding fresh fruits and vegetables to a bird, offer them raw. Although cooking some food makes the nutrients more bioavailable. This means that it makes those vitamins and minerals more easily absorbed by their systems. For instance, slightly cooking sweet potato actually makes them more nutritious. That is one cooked food that could benefit your feathered friend. Bear in mind, there are some foods that need to be cooked before serving your bird. Beans for example, should not be served raw. They must be soaked overnight, drained and rinsed with fresh water and then boiled for about 20 minutes. Once the beans are boiled reduce the heat to simmer and let them simmer until soft. This will ensure that the toxins found in raw beans have been removed. Grains such as quinoa and other ancient grains should be cooked before being served. Add seasonings. Although a little crushed pepper is a welcome addition to any food, salt can be harmful to a pet bird. While sometimes it is best to leave the flavor as nature intended it, some birds simply love some seasonings such as fresh herbs like cilantro and basil. Some birds are wild about a little fresh parsley in their food. Birds don't have the palate that we do so amping up the flavor might just get those tails in the air where they may not take to a blander dish. If cooking, cook wisely. If you do choose to feed your bird a cooked dish, pasta, for example, make sure to prepare it in cookware that does not have a non-stick coating. Stainless steel is preferred, as it won't contaminate the food. Cast iron is a wonderful material for cookware that you can use around your birds. It will simply not harm them. It is easily found in all shapes and sizes and you can even find quality cast iron in second hand stores and garage sales. It is indestructible and will serve your cooking and baking needs for years to come. Make sure the foods you offer aren't toxic to birds. There are, in fact, some "people foods" that are toxic to pet birds, and should never be offered, not even as a treat. Be sure to know what these foods are so that you never serve them to your feathered friend. Introduce fresh foods slowly. Some pet birds, particularly those used to seed and pellet diets, may not be interested in fresh foods right away. When introducing new foods, be sure to offer your bird his regular diet as well, to prevent possible weight loss and illness. By keeping these tips in mind, you should be able to safely incorporate a variety of fresh foods into your bird's diet. Your bird will benefit from the extra nutrients, and sharing meals with your pet can be a great bonding exercise, to boot. If you find that your bird won't try fresh foods at first, don't be discouraged. Eat some of the food in front of your bird, and try being very expressive about how good it is. Once your bird notices how much you enjoy what you're eating, it will only be a matter of time before he or she is ready to take a bite. Cook safely, and happy dining!